 Muuna’s cottage cheese cups with fruit on the bottom come in 6 fruit flavors (photo courtesy Muuna). 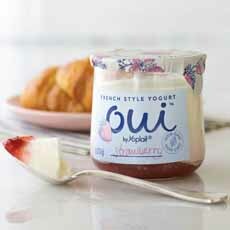 Yoplait’s new French-style yogurt line will have you saying “Oui!” (photo courtesy Oui By Yoplait). We were probably the last person in New York to buy Breakstone Pineapple Cottage Cheese before they discontinued it. It was the Ascension Of Yogurt Era, and grocers eliminated slower-moving SKUs to give the space to the hot ones. 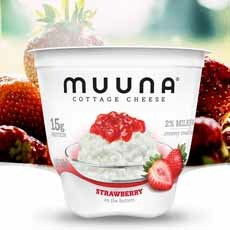 Now, a new brand called Muuna is offering all the fruited cottage cheese our heart desires (photo #1). The line is lowfat and creamy, with the fruit on the bottom that you mix up, like a carton of sundae-style yogurt. It’s also rich in protein: 15g of protein per 5.3-ounce cup. There are also two plain options: 2% and 4% milkfat. The line is all natural, non-GMO, rBST-free and certified kosher by cRc. Welcome back, pineapple cottage cheese—and hello to you other flavors. You’re our Top Pick Of The Week. *See the different types of yogurt. Our co-Top Pick is the new Oui by Yoplait line of yogurt (photo #2). It’s different from every other container of Yoplait you’ve had. Eating yogurt from the perky glass jar, you could imagine you’re in France. The jar (repurposeable or recyclable) makes you look cool and in-the-know. And the yogurt does not disappoint. The company calls it saveur d’autrefois, the taste of yesteryear. The line is certified kosher (dairy) by OK.
Russbe creates reusable lunch containers, but that’s not a product we have need for. 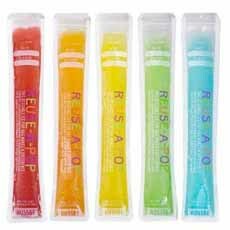 What we do need, and love, are the Reuse-A-Pops bags for creating homemade frozen juice pops, puréed fruit, yogurt, and other frozen pops. The push-up bags (photo #3) with zipper seals ensures no messy leaks or spills. Freeze, enjoy, wash, reuse. At $6.99 for 12, you can’t go wrong. We just enjoyed our first batch: watermelon (from watermelon juice), cantaloupe (from puréed melon) and yogurt-garlic-dill (who says ice pops have to be sweet?). Yum! We live in a neighborhood where crisp, thin-crust pizza is what grown-ups eat. When people order from Pizza Hut, it’s for the kids. We have a reputation to uphold, and hesitate to be seen carrying a deep-dish pizza into the building, no matter how much we need that specific comfort food. 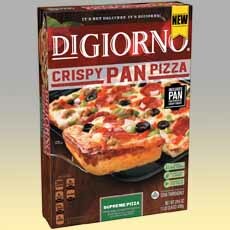 But there’s a solution for our cravings: DiGiorno Crispy Pan Pizza, a frozen pizza from the supermarket in its own pan. We like everything on our pie (or as much of it as we can get). We went for the Supreme: pepperoni, sausage, green and red peppers and black olives. Pan pizza in four flavors stays in the freezer. Twelve minutes in the oven delivers steaming, aromatic comfort food (photo courtesy DiGiorno). In just 12 minutes we pulled the pie—a crunchy outside and a soft inside— fragrant and bubbling from the oven. Now, we just have to clear out the freezer to make room for more DiGiorno boxes.